Week in review for period of June 18, 2010 to June 24, 2010. We were able to erase some but not all of last week’s gains. For this report period, the 12 month avg. price for natural gas at the well-head fell 4.7%, and the avg. 12 month price for electricity on the PJM fell 2.5%. These small price decreases were likely tied to the news that the US economy was growing more slowly than predicted. 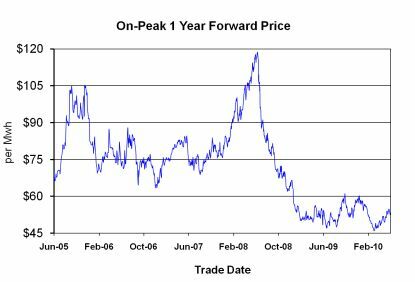 However, many analysts do not expect energy prices to continue this downward move. In fact energy prices are likely to move upward again because we have hot weather in the forecast and a new storm is forming in the Caribbean. NOAA says the storm in the Caribbean is heading towards the Gulf of Mexico and may become a tropical storm in the next 48 hours. Weather is a huge wild card that can quickly place upward pressure on prices this time of the year. This is still a great time to look at the early renewal strategy because prices are low relative to the last 5 years. Storage Update: This week’s reported injection of 81 bcf met expectations. Inventories are now 13.3% above the 5 year avgerage. We are now 0.5% below last year’s storage number. This is the first time in 2 months that storages fell below last year’s levels. Hot weather diverts gas from storage to power plants. Weekly Drilling Rig Update: Active rig count released by Baker and Hughes for week ending June 18, 2010 was 953 rigs which was a net decrease of 1 rig. The rig count is 261 higher than the rig count reported this same week last year. 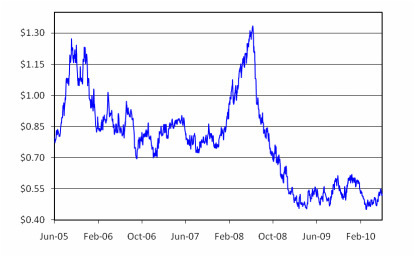 We are still 25% below the 5 year average rig count of 1,264.